The Bigelow Benefits line was created to taste fabulous and help support your well-being. We believe our Benefits teas, as part of your everyday routine, can help you define the life you want to live! This gift contains all 7 Benefit flavors; 16 of each flavor. 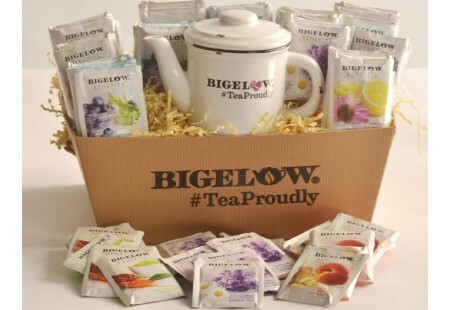 You’ll receive 112 individually wrapped Bigelow Benefits herbal and green teas along with our exclusive “Warm Hugs” teapot that was developed to honor the Norma Pfriem Breast Cancer Center women. Our 12 ounce teapot is just the right size for taking a relaxing break and providing a warm hug to remind special loved ones that others care. Teapot with lid measures 5” tall, 4” in diameter. Microwave and dishwasher safe.